Fanclub Members! Are you ready? It's time for another pre-sale! 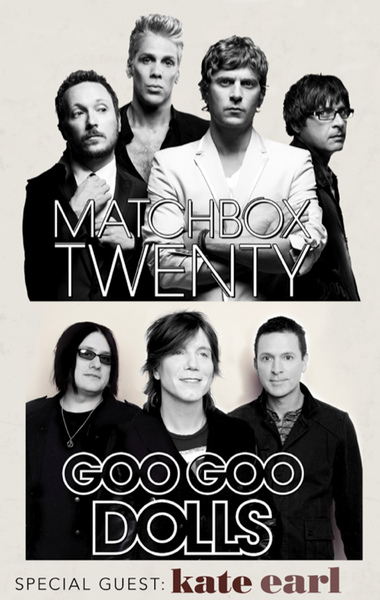 A big chunk of dates on the recently announced Matchbox Twenty & Goo Goo Dolls Summer Tour will be included in a fanclub exclusive pre-sale on Tuesday April 9th at 10am local venue time. Click on any of the dates below for more details & links to tickets and VIP packages. Please note: The shows in Universal City (7/17) and Irvine (7/20) were originally going to be part of this pre-sale. That has changed, and those will now be part of a future pre-sale. Stay tuned for details. You will need a pre-sale code to participate. If you are a current member of the Matchbox Twenty fanclub you will receive a code Monday morning April 8th. If you are not a member yet, join here. More dates will go on sale soon. Stay tuned!